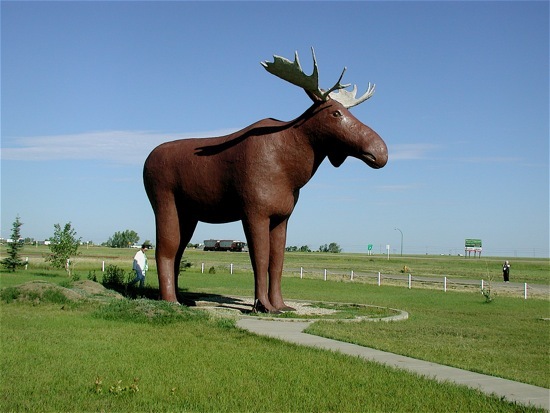 Mac the Moose, a fiberglass moose in Moose Jaw, Saskatchewan. Photo by Sue Frause. I've been to Saskatchewan twice: My debut was in 2004 while on a press trip to Saskatchewan and Manitoba, and the second was five years later on Closet Canuck's Great Big Canadian Train Adventure -- my ten-day VIA Rail Canada trip from Halifax to Vancouver. But I want to get back to the province, having spent only a few days in central Saskatchewan (including Regina and Moose Jaw) and passing through briefly on my train trip. It was only a 25-minute stop in Saskatoon on that dark November night, and I didn't get off. So the city named after the Saskatoon Berry still remains at the top of my Canadian cities bucket list. Saskatchewan People | Photos that reflect the character and spirit of Saskatchewan people (no studio photography). Nature in Saskatchewan | Photos of flora and fauna in natural habitat. Prairie Scenic | Scenic photos from prairie regions of Saskatchewan, including traditional scenes, as well as hidden treasures such as the Qu'Appelle Valley, hills and badlands, and features not typically categorized as "prairie"
My Saskatchewan Vacation | Photos of people having fun during their Saskatchewan vacation. Images may capture adventure, recreation, relaxation or celebration at a favourite attraction, event or destination in Saskatchewan. Urban Life | Images that portray the excitement, sophistication and spirit of our Saskatchewan cities and towns. Photos can also feature events and attractions you experience while visiting our "urban playgrounds." Provincial Parks | Photos of your most treasured memories that took place in a Saskatchewan provincial park. Seven category winners will be awarded, each receiving a $250 gift certificate from Don's Photo. A Grand Prize winner will be selected from the seven, and will receive an additional $250 gift certificate. Five honorable mention winners in each category will also receive a prize. To Enter: Only digital (.jpg or tiff format) submissions will be accepted. Email to snapit@sasktourism.com and include your full name, address, and phone number. Specify the locale of each photograph and indicate which category it falls under. The contest is open to residents of Canada (except Quebec) and the United States.